Six New Orleans police officers have been charged in connection with the fatal shooting of civilians on a bridge in the days after Hurricane Katrina. Four officers are alleged to have opened fire on unarmed people on the city's Danziger Bridge. Two died and four were hurt in the 2005 incident. Two supervisors are accused of joining the four officers in attempting a cover-up in subsequent investigations. The six accused have so far not responded to the charges. According to the US justice department indictment, police officers Kenneth Bowen, Robert Gisevius, Robert Faulcon and Anthony Villavaso opened fire on a family on the east side of the bridge on 4 September 2005, killing a 17-year-old boy and injuring three other people. Media captionEric Holder: "Justice Department will vigorously pursue anyone who allegedly violated the law"
Minutes later, officers were involved in a second shooting on the west side of the bridge, resulting in the death of Ronald Madison, a 40-year-old man with learning difficulties, the indictment says. If convicted over the deaths of civilians, the four could face the death penalty. They also face charges related to a conspiracy to cover up what happened on the bridge and a conspiracy to file charges against two of those injured in the incident, claiming that they had fired at police. Sgts Arthur Kaufman and Gerard Dugue are accused alongside the four officers with trying to cover up what happened. US Attorney General Eric Holder said in a statement: "As our investigation of the Danziger bridge incident shows, the Justice Department will vigorously pursue anyone who allegedly violated the law. "Put simply, we will not tolerate wrongdoing by those who have sworn to protect the public." Five former New Orleans police officers have already pleaded guilty to helping cover up the shootings on the bridge. 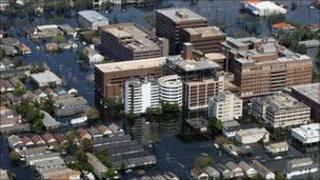 The incident came in the chaotic aftermath of Hurricane Katrina, as the authorities vowed to restore security in the city following a breakdown of law and order. Four days before the shooting, New Orleans Mayor Ray Nagin had ordered 1,500 police officers to leave search-and-rescue missions and return to the streets of the city as looting was turning increasingly hostile. Extra National Guard units were also brought in to tackle the lawlessness, with reports of shootings, carjackings, rapes and attacks on police officers. However, some officers from a police department with a history of corruption turned to crime themselves. The Danziger Bridge case is one of several incidents of alleged misconduct of New Orleans police in the aftermath of the storm. Last month, five officers were charged in the shooting death of a 31-year-old man. Dozens of officers were fired or suspended for abandoning their posts during the crisis. The New Orleans' new mayor has since replaced the head of police and called in a team from the Justice Department to overhaul the city's police department.